For the first time since late September, SpaceShipTwo performed a glide flight on Tuesday. Parabolic Arc, citing a report in the Antelope Valley Press (hidden behind a paywall), reported that SpaceShipTwo made a glide flight Tuesday above Mojave Air and Space Port. (The test flight has not, as of early Thursday morning, appeared on Scaled Composites’s flight logs for the vehicle.) The last glide flight for SpaceShipTwo was in late September, when it went into a stall shortly after release from WhiteKnightTwo. The resumption of glide flights was expected after a series of WK2 flights and a captive carry flight with SpaceShipTwo earlier this month. This new series of flight tests comes as Virgin Galactic is preparing for a major announcement next month at the Farnborough International Airshow outside London. 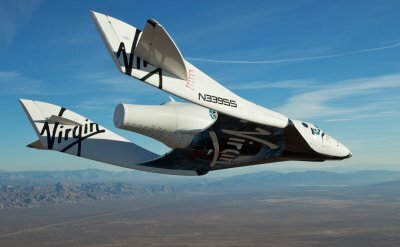 “Virgin Galactic will announce an expansion to the company’s current business plans of space tourism and research, which will support government agencies, defense and commercial customers,” the media advisory reads. That, SPACE.com reported this week, is likely to be a resumption of its smallsat launch efforts, which the company first said in 2009 it was pursuing but, more recently, appeared to be on the back burner. A full-scale replica of SpaceShipTwo will also be on display at Farnborough, which may also incorporate some minor design changes to address that stall incident last September.